What if pruning, as we know it today, had begun in the vineyards of Elciego? If we look at some interesting historical sources, such as the wonderful blog of local historian Jesús Fernández Ibáñez, we discover that our village was one of the first places in Rioja, and in Spain in general, to adopt the secateurs that we still use today. 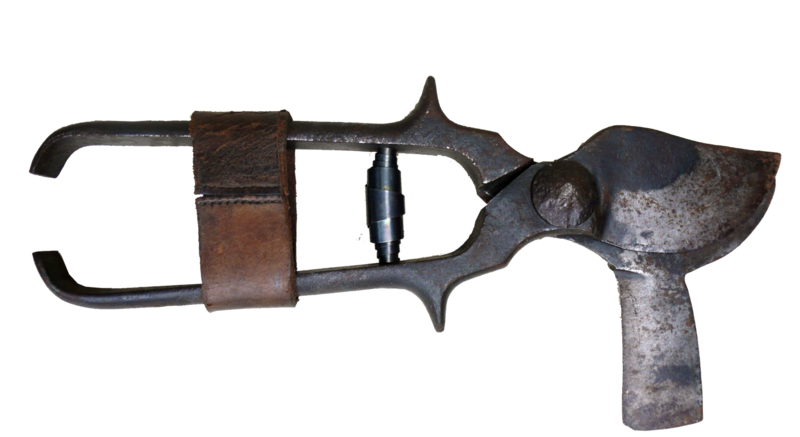 As expected, the arrival of this pruning tool in Rioja Alavesa is closely linked to Jean Pineau, the famous French master winemaker who was hired by the Alava Provincial Council between 1862 and 1868. Pineau came here with a very clear mandate: to try out and introduce modern grape growing and winemaking practices in our region to produce more refined and, above all, longer-livedwines than those made until then. Pineau’s influence was enormous and decisive, especially after he was hired by the Hurtado de Amézaga family, fromMarqués de Riscal, one of the largest producers in Elciego. It is believed that at that time, around the mid 1870s, Jean Pineau introduced the secateurs from France, where they were gradually replacing the ancient “serpes”, the pruning knife known as “corquete” in Rioja, a small machete with a curved blade towards the tip. Pruning knives have been used since the Iron Age, more than 1,000 years before our time. Farmers used them to cut the branches of trees and crops all over the Mediterranean and beyond. Their design has barely changed over theircenturies-old history. It is interesting to observe the similarities between pruning knives of such distant places as Provence, in the south of France, and the easternmost hills of Hungary. With its thoroughly practical everyday character, this agricultural tool usually appears in the most diverse archaeological sites. In the image below you can seetwo pruning knives found in the Languedoc and in Tuscany. The first, on the left, is from the HighMiddle Ages. The second is much older, from Etruscan times. A good use of a pruning knife involvescuttingthe shootclean. A kind of fast and very precise blow. It requires experience, patience and a good deal of energy. Secateurs made the process much more efficient. They are much easier to handle, as they distribute the force better and, above all, make it possible to increase accuracy. The first scissors used by our grape growers at the end of the 19th century are said to besimilar to those in this picture above. One of the two opposite blades had a kind of axe on the back, which allowed the small knots of the vine shoot to be cut in the “old-fashioned” style. We could say that, in a way, this tool represented the transition between a pruning knife and the modern scissors. In a video recorded by some residents of Elciego during a visit to Château Lauga, a winery in the Médoc related with Jean Pineau, we can understand this hybrid use of the primitive secateurs.